Last week, Phelps Helps had the opportunity to visit both Alexander Galt and Bishop’s University to recruit students and volunteers. At Galt, Jayme had a kiosk in the Networking Zone of the second annual career day: Unlock your Future: Discover Opportunities in the Eastern Townships. This was an excellent chance to speak with students about some recent changes to our High School Tutoring Program, most notably the offering expanding to three evenings (Tuesday Wednesday and Thursday) in both languages, as well as recruit some new participants for the program. As the event targeted levels 4 and 5 students planning their futures, she encouraged Stanstead area students to take advantage of our Compass Program, offering individual support for applying to CEGEP, vocational training, financial assistance, as well as finding employment. At Bishop’s University, Clea spoke to students about volunteering at our weekly sessions. 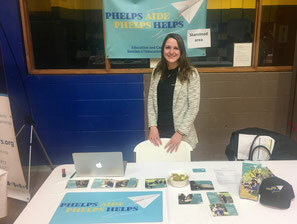 She explained how volunteering with Phelps Helps does not mean being an expert in any specific subject. Our volunteers play sports with elementary students, support elementary and high school student learning and act as positive role models. This call for volunteers is not limited to University students. If you have a willingness to create a positive relationship with a local youth, sign up as a volunteer today by emailing ccorman@phelpshelps.ca or calling 819-704-0799.